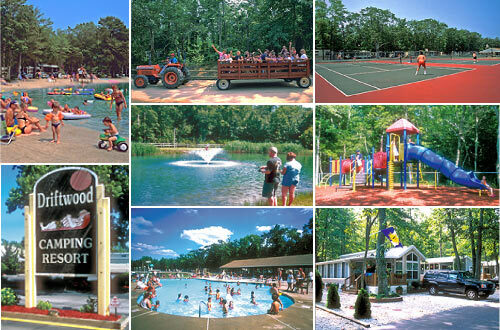 Located midway between Atlantic City and Cape May, Driftwood Camping Resort offers your family a choice of 700 spacious, shady sites on over 200 acres of recreational fun. Included are a large freshwater lake with sandy beach, two spacious swimming pools, a great kid-friendly playground, and all-season tennis courts. Driftwood Camping Resort now offers online reservation to make it easy for you to reserve your campsite, trailer rental or rustic cabin rental. You can also own your own place at the shore and not miss a single day of the camping season with a Park Model RV at one of our two campground locations. Visit our website > click here. Sites range from primitive tent sites to full hook-up site featuring picnic tables, fireplaces, and 30/50-amp electric service. Special recreational camp activities are offered at Driftwood Camping Resort throughout July and August, including a Family Carnival and Christmas in July Weekend. Driftwood Camping Resort is open mid-April thru mid-October.